The point is that you have to strip your writing down before you can build it back up. You must know what the essential tools are and what job they were designed to do. Extending the metaphor of carpentry, it’s first necessary to be able to saw wood neatly and to drive nails. Later you can bevel the edges or add elegant finials, if that’s your taste. But you can never forget that you are practicing a craft that’s based on certain principles. If the nails are weak, your house will collapse. If your verbs are weak and your syntax is rickety, your sentences will fall apart. I’ll admit that certain nonfiction writers, like Tom Wolfe and Norman Mailer, have built some remarkable houses. But these are writers who spent years learning their craft, and when at last they raised their fanciful turrets and hanging gardens, to the surprise of all of us who never dreamed of such ornamentation, they knew what they were doing. Nobody becomes Tom Wolfe overnight, not even Tom Wolfe. The second part—Methods—deals with threes topics: unity, the lead and the ending, bits & pieces. In this part Zinsser explains one of the most fundamental truths of writing—“You learn to write by writing.” The first chapter in this section deals with the importance of unity—unity of pronoun, unity of tense, unity of mood, etc.—and why it is important to choose one unity and stick to it. The second chapter discusses the importance of leads (beginning) and ending. The author illustrates the various methods for writing captivating and interesting leads. He also tells us when and how to stop for maximum effect. In the chapter titled ‘Bits & Pieces’ the author deals with the correct usage of verbs, adverbs, adjectives, qualifiers, punctuation, and more. This is one of the best chapters of the book. Part III (Forms), deals with the various forms of writing. The forms covered are nonfiction as literature, writing about people, places, yourself, science and technology, business, sports, arts, humor, etc. 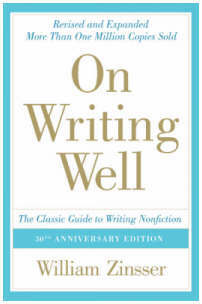 Each chapter gives valuable advice on how to make the writing interesting, how to find the right tone and mood and tips and techniques that the author has learned in his long and diverse writing career. Writing is related to character. If your values are sound, your writing will be sound. It all begins with intention. Figure out what you want to do and how you want to do it, and work your way with humanity and integrity to the completed article. Then you’ll have something to sell. The chapter, A Writer’s Decisions, deals with the different decisions that a writer has to make during the writing process. With clear examples, the author illustrates how to create the leads, how to organize the content, what to include and what to omit, how to end, and so on. This part also has a chapter on how to write family histories and memoirs. The final chapter of the book is about how one becomes a writer, the importance of editors, and how to work with editors to improve the quality of your work. Living is the trick. Writers who write interestingly tend to be men and women who keep themselves interested. That’s almost the whole point of becoming a writer. I’ve used writing to give myself an interesting life and a continuing education. If you write about subjects you think you would enjoy knowing about, your enjoyment will show in what you write. Learning is a tonic. Amita: Thanks, it is really a nice book. Must for all writers. An elegant review.I would like to buy this book as early as possible.Thanks a lot.